The Royal Oak Frosted Gold is a success story that might have never happened. Luckily, jewelry designer Carolina Bucci, working hard on her burgeoning jewelry business, was in the market for a new watch. “I design jewelry, so my husband has a harder job than most husbands to buy me presents, because jewelry is out of the question,” Bucci explains. “In the past, he has typically bought me art, since he is an art dealer, and more personally, watches. Lately, watches have become the go-to present, which I love. Not just any Royal Oak–it turned out to be a vintage yellow gold Royal Oak. Bucci set her husband on the path to finding this watch, only to be told that the company no longer made this reference. Bucci’s husband found it on the pre-owned market and it quickly became Bucci’s favorite. Bucci is a high-profile personality in the jewelry world, and after several articles appeared in the mainstream press, with pictures featuring her wearing that Royal Oak–in particular a story in the Financial Times’ “How to Spend It” supplement, where she specifically mentioned that watch –she was introduced to François-Henry Bennahmias, the CEO of Audemars Piguet. “We got to know each other better: I went to Switzerland to learn more about their world, and they came to Florence to see my world,” Bucci recalls. “After this ‘professional dating,’ we realized although we were two very different companies we had a lot of common values and vision. Bucci has been a watch fan for a number of years, and she came by the interest naturally. Her great-grandfather used to repair pocket watches and that love and appreciation for timepieces was passed down to her father and then to her. Responding to the challenge from Bennahmias, Bucci immediately starting thinking of her signature technique, the Florentine Finish. This is an ancient technique that Bucci has used on her jewelry for years and it is accomplished by a diamond-tipped tool which beats the gold, creating tiny indentations on the surface. Getting the technique right was a challenge, Bucci admits. The first trials were not refined enough and didn’t achieve the design goal. Bucci quickly realized that her technique had to be refined to fit watchmaking. In the end, Bucci’s technique was adapted by Audemars Piguet’s craftsmen using a special tool which hammers the gold at 12,000 beats per minute, creating small holes and facets. It took great effort and months of trial and error to alter the surface of the gold in such a way that it sparkles when catching the light, while retaining the soft, clean lines that define the Royal Oak’s form. Such a delicate balance is difficult to achieve: nothing is added, nothing is removed, yet the watch is transformed. The result? When the light hits the facets in the gold, they sparkle. 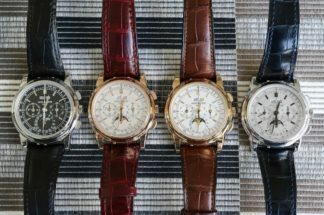 2017 saw the introduction of the first Frosted Gold pieces, in white and rose gold, at 33mm and 37mm—immediately, they turned heads and took SIHH by storm. Rarely has the industry seen such buzz about a watch, especially a watch “finish” like this, ever. 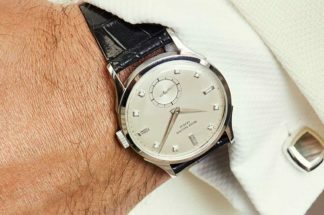 Then, later in the year, Audemars Piguet brought out a new size, 41mm, in white gold only, limited to 200 pieces, to appeal to both men and women. This was in response to men who wanted to be able to wear the Frosted Gold, and for women who wanted something slightly bigger. The introduction of the Royal Oak Frosted Gold was a coup for the brand. 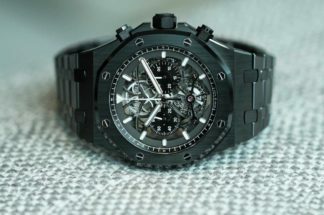 Not only was it a stunning version of the Royal Oak, it was different from anything else on the market. Taking a jewelry technique and using it on such an icon was a risk, but one that has really paid off for Audemars Piguet. The latest version of the collection has just been introduced, this time in yellow gold. According to Bucci, this is the ultimate version, the one she wanted to make since she first got the idea. “When we launched the first frosted gold in white gold and pink gold, for me they were a trial, to see if they would work,” she admits. “Everything I design is selfish, I design for what I like, so before I did this ultimate collaboration with a watchmaker, I felt I had to earn it. They were received incredibly well, so now it is time to do the yellow gold. The original Royal Oak used the traditional tapisserie dial that has become a signature for Audemars Piguet. Of course, Bucci wanted to change this as well in the yellow gold version, but she met with strong resistance from the brand. 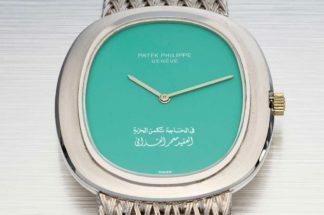 “With the first watch, I messed with the case and the bracelet, but I left the dial completely untouched,” she details. “But with this watch, I wanted to include the dial too. When I presented what I wanted to do, their first response was a strong no. But, because I am really stubborn and confident, I kept pushing and wanted to try it. I was told that this dial is how it had always been, but I knew we had to move forward and I convinced them that the mirror effect would contrast nicely with the irregularity of the Florentine finish. The mirror finish dial is the ultimate nightmare for production, however, because there is no room for even one mistake, one speck of dust, one scratch. Only perfection works, but we achieved it. I think the result is better than I even imagined. Bucci was surprised that the first Royal Oak Frosted Gold edition appealed to men as strongly as they did, and she expects the new yellow gold version to attract male customers as well. “I think this version, which is imagined for women, will be popular for men as well,” Bucci says. “In my head, the customer is a strong confident woman, with a style that is unique.” The new Royal Oak Frosted Gold Carolina Bucci Limited Edition is limited to 300 pieces worldwide. Frosted Gold surprised and captivated the watch world last year, and this year’s addition with the Carolina Bucci Limited Edition Royal Oak Frosted Gold in yellow gold—the ultimate edition—the frosting on the cake only gets better. Hammered 18-karat yellow gold case, glare-proofed sapphire crystal and caseback, screw-locked crown, water-resistant to 50m. Silver-toned mirror dial, yellow gold applied hour-markers and Royal Oak hands with luminescent coating. Hammered 18-karat yellow gold bracelet with “AP” folding clasp. Hours, minutes, center seconds, date.